Every afternoon, just after the final school bell rings, 13-year-old Dak heads to the fields. There, he marvels at the kale growing taller, the eggplants turning deeper shades of purple and the peanuts crawling further. He notices the weeds that seem to sprout overnight and quickly pinches them away. He finds the areas where ground has cracked by the hard South Sudanese heat and turns to get a watering can. For Dak, this is his place of wonder, his sanctuary. This is a place where he forgets he is not home – that he might never go back. In this spot, he forgets that his father was killed while his family ran from the fighting that engulfed their village three years ago. “When I look at the garden, I feel peaceful,” Dak says. 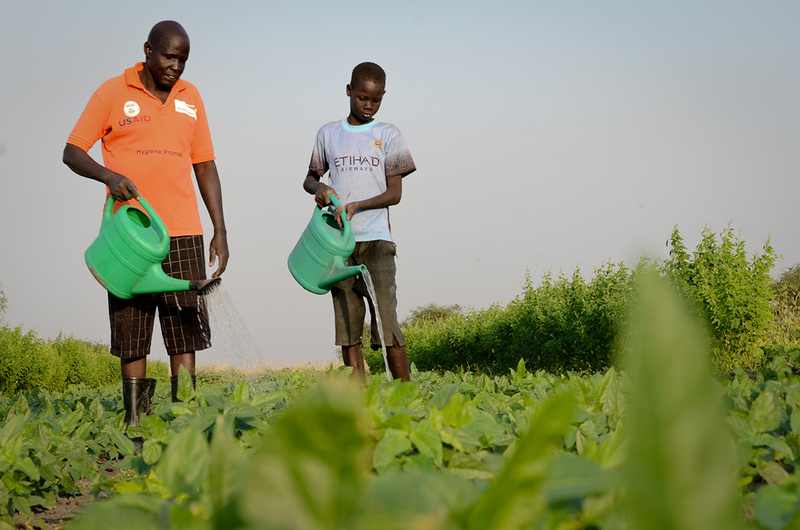 This 2.0 hectare garden, run by his uncle, serves as a model – a field to aspire to – for the 23,000 people living nearby who have been displaced by South Sudan’s ongoing conflict. These fields are hope, of possibility, are desperately needed symbols for people who lost everything. “We came with nothing,” says Jacob Thon Malual, Dak’s uncle. The 49-year-old part-time Anglican preacher and his family were reeling from loss. Two of his children and his brother were killed in the 2014 conflict, his grandchildren and nephews orphaned. Jacob and his family escaped, walking with the orphaned children for 22 days. “The biggest challenge we faced was a shortage of food when walking here. We survived on water and wild fruits and weeds that were growing on the side of the road. They tasted so bitter,” explains Martha Nabisha Khar, Jacob’s wife. Finally, the family arrived in the area on the banks of the River Nile that was declared a safe zone for people running from the conflict. Like the thousands of other displaced families, Jacob and Martha set up a house made of plastic sheets that they received from a non-governmental organization. World Vision and other international humanitarian agencies began working in the settlement, providing families with food, setting up clean water points, constructing schools and starting a gardening project. Jacob, who was a large scale farmer in the past, quickly signed up to join the World Vision organized gardening project, receiving seeds and training. Within a few months, he gathered his first harvest: kale, okra, eggplant, spinach, pumpkin, and peanuts. “We expanded. We started renting land from a local farmer. We are always here, we are always busy, we dig, we water, we sell directly from the field to people coming to us in the garden,” Jacob says. In three years, his garden has been such a success that he now employs five to seven people every day. He received a generator from World Vision to pump water from the Nile to irrigate his vegetables. Jacob’s garden is now the site for people who used to rely solely on cattle herding to learn how to grow vegetables. As a lead farmer, he shows people how to make a profit from gardening. “During the rainy season, many people are growing vegetables near their homes now. 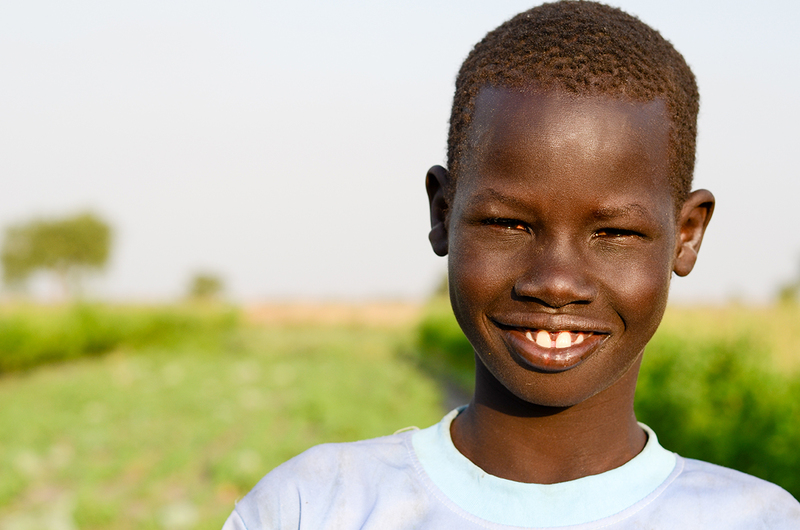 World Vision helps a lot by giving people seeds and other agricultural training,” Jacob says. And while it’s not yet safe to return home, Jacob has changed his opinion on life in the settlement. “From that time when we arrived, to now, there’s a big change. Every year there’s an improvement, life is improving,” he says. For Dak and the other orphaned children Jacob and Martha take care of, this place is one that offers a sense of possibility, of growth, of learning new skills and of responsibility. Photos: Dak’s family was able to start a garden thanks to support from a World Vision agricultural program for people displaced by conflict. ©2018 World Vision, Mark Nonkes. Beautiful story and there is no place better than a garden where God can renew and refresh the human spirit. We wish for nothing more than fulfillment in the lives of Dak and Jacob and their friends and family.